Made of natural mineral salts and completely free of perfumes, chemicals, and dyes. Crystal Body Deodorant will leave an invisible protective barrier against odor causing bacteria on your skin. Our patented twist-up stick offers the economy of our rock in an easy to use and easy to hold container. It can last up to one year with proper use. Slightly moisten the top of the stick and apply generously to clean skin. Does the job, what else can I say ? I've been using this for many years and will not use anything else. Lasts very long. One stick usually lasts me a year and a half, therefore very economical. I needed to change my deoderant once I started developing a nasty rash in my armpit. I tried a couple that were gentler on my skin, but they weren't very effective. I tried the crystal deoderant , thinking I didn't have much to lose. To my amazement, it works incredibly well. It is gentle, but it is very effective. And, it really lasts a long time. I don't think I will every need to look for another deoderant! No odor, best of all no residue! Works great does and it does not stain. Works really well. Has an odd scent when applying, which goes away within a minute, it is just the alum (Preservative). Love this deodorant! It works and doesn't have a scent or stain clothing! I was having some really stinky problems for a long time and I couldn't figure out what the problem was. It turns out it's not me, it was a combination of waxy deodorants, detergent and fabric softener I was using - they were leaving behind residue on my clothes and making them smell putrid the next time I wore the shirt (even after washing). I quit using fabric softener, and now after the initial wash cycle, I rinse all my clothes with vinegar to get any residue off, and I switched to crystal deodorants. No residue, no stains, no stinky leftovers, and I found it worked for 24 hours. If you're finding you're still stinky when using, you might have waxy / soapy perfume residue left on your skin; wipe your armpits with vinegar or rubbing alcohol, rinse with water before applying deodorant. So far so good, works well for me. Good value for money. Best of all it is safe to use. Works well to keep the odor away. Takes a bit of getting used to if you've never used a crystal deodorant before. Does sting for a few seconds if applied immediately after shaving, but that goes away quickly. Does not cause irritation like some cream natural brands. Love that it has minimal ingredients and comes in a roll up holder to make it easier to use. There's absolutely no reason to use any of those nasty deodorants, or especially antiperspirants, that line the shelves of every pharmacy and grocery store. 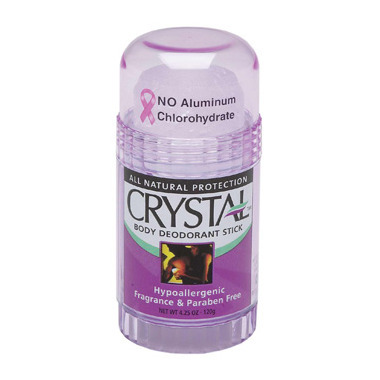 Products like the Crystal Body Deodorant Stick use ammonium alum combined with water. That's it. This product does the job perfectly. No irritation or reactions and no smells. I have used the Crystal Body Deodorant Stick for many years. It keeps me odour-free, has never caused skin irritation, and does not come off on my clothing. I have used the liquid version of this product, but prefer the solid stick. I apply it after my morning shower while my skin is still wet. Also, it lasts for ages too. I've been using this type of deodorant for a number of years now. It works very well. No chance of irritated skin using this product. It is amazing that this stone actually works! no more rash/allergy, no more underarm stain on clothing. Highly recommended! I have been using this deodorant for just a few weeks and so far so good. It prevents odour from sweat. This product really works at preventing odour. If I don't apply it every day, it starts to wear off. It feels a little weird at first when you are used to antiperspirant, but definitely a good product. I didnt think this deodorant would be effective when I first purchased it. I was wrong. It completely eliminates odour and makes your pits smell like absolutely nothing. It wont prevent sweating, although that is not what it was designed to do. It doesnt leave any marks on clothes, however, your clothes will begin to smell (due to bacteria growth on it) after a while if you're an excessive 'sweater'. So wear and change your t-shirts often and sweat away. This is an awesome product. I have been using it for about a year now and love it. I don't sweat a lot, so I don't know how well it would work for people who need something stronger, but I can not imagine using anything else. It is natural, inexpensive and lasts forever. I have had the same stick for about a year and there is plenty left. If you are not sure, try it-the travel size is cheaper than most deodorants on the market. I've used this for 10 years and it never stops working. It's just a simple product so it works. Pure salt. The only way to go. I've been using it for years but could no longer find it in the stores, so tried on-line. The Delivery was quick and efficient. This is a great product since I have found some of the deodorant sticks are not strong enough. With the crystal, I have yet to have a problem. I will say, if you wet the crystal it will eventually begin the come loose from the holder. I found its better to wet your underarm area first and then apply the crystal that way. I loved the concept of this stick. However, I did not find it effective enough. I also had a mild rash after using it. Love this product. I have been using it for a couple of years now, because I like that it's natural, and it works great! I will definitely be buying this product again. situations. What is important to know is that, if you are switching from a "regular" deodorant, specially an antiperspirant, it might take you some time before you will be as happy as me about using this crystal stick and here is why. Antiperspirants, full of chemicals that are bad for you, work by clogging your pores, that's why we don't smell. So whatever your sweat glands produce, most of it will accumulate in your body, that's why we stay "dry". Once you use this Crystal product, your pores will stay open and release all that accumulated stuff. It will take some time to get rid of it all, in my case only about 2 weeks. So, most people think the Crystal products don't work but they are the very best and healthiest on the market, just give your body a chance to do what it's meant to do. And one of those sticks lasts forever, years! This is a great product! I do find that it doesn't keep me as dry as typical anti-perspirants (obviously), so I do feel a little more moist but there is no smell and no trace of product. It lasts the whole day and the stick itself lasts a very long time. I will definitely recommend this product to other people. So far I have found this product to be very good. I've been using this product for at least 10 years and it still works great. I like the fact that it's just a natural stone without any chemicals in it. Either wet your skin or the stone before putting it on. It won't go on dry. I am allergic to most deodorants so when the product I was using was discontinued I went looking for an alternative. I came across your CRYSTAL deodorant and decided to try it. I am VERY glad I did! Absolutely no reaction to it, and (for me) it works great, even with strenuous "sweaty" activity! I have even gone 2 active days (in the bush) without showering and had NO smell at all! This is great. It's much easier to handle than the loose crystal stones. I was very pleased with this product. very hesitant in the beginning, but soon found out it is a great produce. No mess , no stains on clothing and i am very sensitive to most products. i have had good results and will continue using this product. This crystal deodorant works very well for me. I apply it after a shower when my armpits are still damp and I have yet to detect any odor after a full day. I like that it's light, easy to use, and very effective. I prefer allowing my sweat glands to work instead of blocking them with antiperspirants. I highly recommend this to anyone. I like the natural and safe alternative to deodorant. I was surprised how well it works! One drawback is needing water to wet the crystal. Sometimes this is really inconvenient. I was a skeptic but I thought, meh, 8 bucks...can't go wrong if it works right? I find that prevention is always a better solution. Voila, works great. Didn't have a problem with the stick having to be wet like some others did. No odours and no problems. This product is amazing! I was allergic to a number of deodorants so I didn't use any for years. This stick is all natural, hypoallergenic and works extremely well! I even got my husband hooked on it now! stop working after awhile, but not this one. There is no residue, and it works all day and does not irritate your skin. Let it dry before you dress. I will never buy other deodorants. I'm staying with this one. One stick lasts for about 1 year. No other product I have used lasts that long.